In May of 2012, Governor Kitzhaber signed executive order EO 12-07http://www.oregon.gov/LCD/docs/general/EO12-07RegionalFarmandForestLand.pdf to establish the "Southern Oregon Regional Pilot Program". 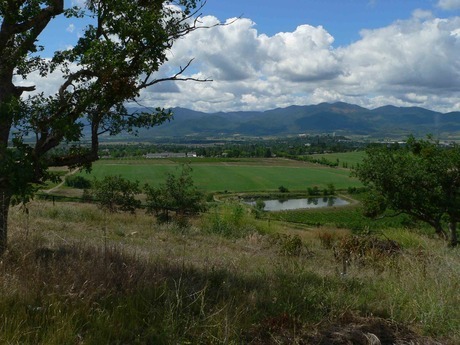 Depending on how it plays out, this plan could potentially become a land use program “game changer” diminishing farm and forestland and increasing rural sprawl in the Rogue Valley as well as becoming a model for other regions or counties to emulate. The program includes three counties—Jackson, Josephine & Douglas—and authorizes them to engage in a process in which they develop a plan that allows "appropriate additional regional variation in what lands must be planned and managed as farm and forest lands" i.e. these counties get to redefine what farmland and forestland are. While “appropriate additional regional variation” makes this project sound innocuous the driving force behind this effort is to get blanket access to more rural land for development, which up to this point is off limits due to it’s resource zoning. To achieve this means changing zoning on a grand scale. Currently zoning of resource lands can be changed only one lot or parcel at a time and only if it can be shown that the land does not qualify as resource land under the current rules. This is big brush planning that will, if implemented, determine the type of rural landscape we live in and effect the affordability of our communities for along time. It will also set a precedent for more of the same elsewhere in the state. This project is in fact the latest result of the ongoing assault from shortsighted development interests on our long-standing and successful statewide farm and forestlands safeguards. The ultimate intent of these interests is to dismantle Oregon’s land use system or at least neuter it in order to open up as much land as possible for development regardless of the impacts to agriculture or long term livability. The strategy has been to essentially divide and conquer by getting rules passed at the local or regional level that are contrary to the very heart of the state land use goals and purpose and then clone them to the rest of the state one region at a time. Southern Oregon and particularly Jackson County have been ground zero over the last five years for this effort to Balkanize statewide land use under the banner of local control and private property rights. In 2012 two bills were introduced to create a special regional definition for farm and forestland in the three counties. These bills were based on unsupported claims that there is allot of incorrectly zoned land in the region that should not be considered productive resource land and current land use laws do not allow this error to be corrected. These bills did not make it out of committee but the effort was apparently gaining momentum in Salem. Prior to a reintroduction of these bills in the following session the Governor signed this order allocating $550,000 dollars for the process. Like most of the attempts to undermine statewide land use this one starts with a thread of truth but then stretches it beyond reasonable credibility. The rationale for this process has been that Southern Oregon is different from the rest of the state (climactically and geologically to name two examples) and therefore should not have resource lands measured with the same yardstick as the Willamette Valley or the rest of the state. While it is true that Southern Oregon is unique in some respects it is also true that the three counties involved in this project are quite different from each other. It doesn’t make sense to have a regional definition for dissimilar counties especially when there are already several ways that the counties can create local variations under established rules. Another rationale given is that much land was incorrectly zoned as resource land when this region’s Counties first adopted their Comprehensive Plans and therefore these errors should be corrected. But the remedy proposed is to redefine resource land not just correct mapping errors. And the proponents of redefinitions have consistently neglected to mention that there are likely zoning errors that have liquidated resource lands in the past that arguably should be corrected as well. Clearly these are just excuses to justify the desire to get at as much rural lands as possible that have previously been of limits to non resource development. This push to increase rural sprawl is clearly not what the general public needs or wants. For example, while preparing it’s Alternative Futures Element (adopted in 1980) of it’s Comprehensive Plan, Jackson County asked the public how they wanted to see the county’s urban and rural areas grow. In essence the county offered to visions: a sprawling future or one that kept development in town and country compact. They received extensive comment with the strongest public support for a keeping the county compact (see Element 3 Alternative Futures, Jackson County Comprehensive Plan http://www.co.jackson.or.us/Page.asp?NavID=3725). This public input was included in this element of the Comp. Plan as a series of county land use conservation policies that included keeping rural growth in hamlets while avoiding five-acre sprawl. Since the adoption of this plan there have been several other significant public surveys in Jackson County that have all reaffirmed the public preference for conservation of land and resources. Sprawling cities and rural communities are also a serious drain on the public purse. 1000 Friends of Oregon’s recently released study titled Extensive is Expensive makes a clear case for the need to keep from sprawling outward if our communities are to stay fiscally solvent (see 1KFriends Cost of Sprawl report below). While it is clear our communities cannot afford to go on spreading out across the landscape this is nonetheless the aim of developers and this direction appears to have the full support of our county leaders at this time regardless of the public voice and the abundant evidence that we can no longer afford the old style of growth. The counties are also rushing this process through because there is no guarantee of further funding beyond the June deadline for this project. This rush to wrap this project up means limited citizen input into the process with only two opportunities for the public to make comment on the details of the proposed changes (see http://www.soregionalpilot.org/ct-menu-item-17.html for details). At this time these two opportunities for public comment are tentatively scheduled in such a manner that meaningful comment will be severely restricted due to a lack of information needed to evaluate just what lands this plan will actually involve. Regardless of which side of the land use debate a person is on this is an infringement of their basic right under Goal 1 to have sufficient and meaningful opportunities to participate in the process. The only other opportunity for the public to participate in this process is during the Technical Advisory Committee meetings and then only as observers as this is not a public hearing body. 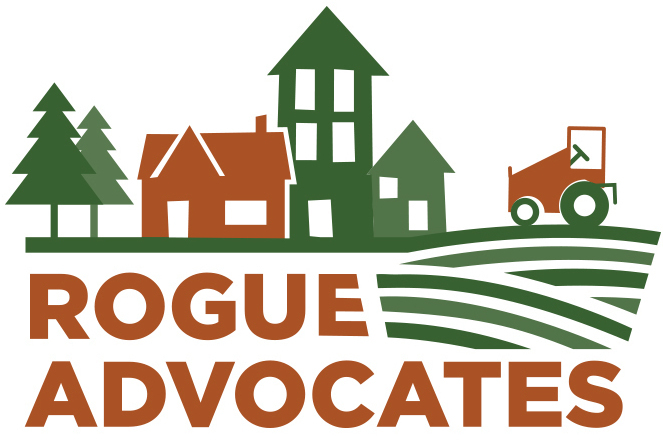 The Technical Advisory Committees (with representatives from Rogue Advocates and 1000 Friends of Oregon as well as farmers, developers representatives and agency professionals) will explore alternative farmland size definitions, forestland use definitions and designations of non-resource lands. Rogue Advocates will be keeping an eye on this process to ensure that it does not turn into a land grab.